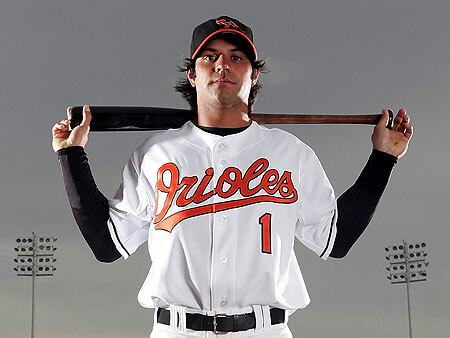 For the best prices on all Baseball Tickets, including Baltimore Orioles Tickets, visit Vividseats.com. We have the best selection of Atlanta Braves Tickets, Tigers MLB Tickets, and many more or find information on the Cincinnati Reds Game Schedule! That’s right, what follows is an interview with Brian Roberts. Its kind of a big deal. Brian has his new “Brian’s Bracelet, which gets talked about in the interview, so I’ll let him explain it. Me: First, Let’s talk about Brian’s Bracelet. They’re new and the proceeds go to a very worthy cause. Can you tell us a little how this came about and about the charities where the proceeds go and how they help them? Brian Roberts: When GameWear came to me with the idea of Brian’s Bracelet, I immediately knew it was something I wanted to be part of. GameWear created an Orioles-themed bracelet featuring the team’s orange and black team colors with a silhoutte of me holding the hands of two children. What makes Brian’s Bracelet so special is that all the proceeds from sales to programs at the University of Maryland Hospital for Children (UMHC). So when you buy a bracelet, your money is directly impacting how children play and cope during their hospital stays. As you may know, I had a heart condition as a child and had open heart surgery at age 5. I spent my time in the hospital wishing I could go outside and play. The programs at UMHC help makes kids’ hospitals stays more comfortable and helps alleivate their stress. I wish programs like that were more prolific then as they are now. I’m really proud to be partnered with GameWear for this important Program. I wear it all the time — look for it on my wrist on our next game.! Me: The season so far has been a nice surprise. The offense has been better than I had hoped and even in the games where you’ve been behind, the team has come back to win or tried their best. How has the atmosphere been with the team this season with the new additions, the departures, and the low expectations of the national media (although to be honest, I had some low expectations at season’s start). BR: I don’t blame you. Media, fans, and even some teammates low expectations. We went through a lot of changes, losing Miggy and Bedard and outside perception that wasn’t very good. We struggled offensively the first couple of months, but the team has meshed well together and I think we’re going to surprise a lot people in the season half by improving on our start. If you look at the numbers, we’re comparable to a lot of the top teams and our goal is to stay competitive, play our best, and win games. Me: How is it playing for Dave Trembley. What has he brought to the clubhouse that other managers in the past hadn’t. BR: Dave is great. He’s optimistic, teaches the game, but also just lets you play. He’s relaxed, too, and the calming influence in the dugout and his presence is good for us. We have quite a few veterans but also a lot of young players that were recently in the minors, and Dave’s minor league experience has been good for both sides. BR: Probably first ground ground ball I got. I was nervous and scared. Mike Piazza hit it right at me and I was literally shaking when I fielded the ball and threw it to first. I saw Mike walk back to the dugout and looked over to my right and Cal Ripken gave me a nod…that’s when I knew. Me: Who were some of the players when you were a kid that and still now that you look up to and pattern your game after? BR: I looked up to a lot of my Dad’s former players. Guys like BJ Surhoff and Walt Weiss that come up through his system. They were great players, but I also knew them personally and that taught me a lot. Ozzie Smith, too. Any of the smaller switch hitting infielders. Any of the All Star Shortstops of the late 80’s. I haven’t tried necessarily to pattern my game after any one player, but I learned a lot watching each one play. Me: What’s your usual gameday routine? BR: Breakfast around 10:30 am then relax and read or watch TV. Get to the ballpark around 2:30 pm. Weight room, then batting practice around 4:30-5:00 pm. I keep it simple and don’t deviate much. Me: What are some of your favorite ballparks to play at beside Camden Yards? BR: Yankee Stadium and Fenway because of the history and tradition. Nationals Stadium is pretty incredible. Mariners also have a really nice ballpark and facilities. That’s was cool. I got to ask Brian Roberts a few questions. I did shy away from trade questions because I was pretty sure he’s been asked those questions a couple thousand times. He is the MAN! I got to interview him once for an event at Camden Yards…he is a class act and very genuine. Plan out your fall NFL betting season with a visit to BroburySports.com. Then, when it's time for basketball betting you'll already be plugged into one of the best sportsbooks the web has to offer.